Christopher Nolan’s third Batman film, The Dark Knight Rises, is set eight years after The Dark Knight, the director noted in a recent interview with Empire. 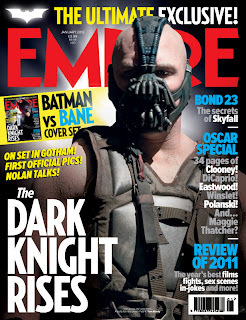 Of the film’s primary villain, the brutish and calculating Bane, Nolan added that he wanted to put The Caped Crusader to the ultimate test in the conclusion to his trilogy. How physically? Actor Tom Hardy—who plays the baddie who infamously broke Batman’s back in the comics—went into sickening detail about Bane’s fighting technique. “It’s about carnage,” Hardy said. “The style is heavy-handed, heavy-footed, it’s nasty. Anything from small-joint manipulation to crushing skulls, crushing rib cages, stamping on shins and knees and necks and collarbones and snapping heads off and tearing his fists through chests, ripping out spinal columns. He is a terrorist in mentality as well as brutal action." Ouch. The latest issue of Empire is on newsstands now. For more on this story, click here. I’m typically not one to get into personal matters on my blog, partially because the stories of my life aren’t particularly exciting but mostly because it’s more fun to use The Wort Report to detach myself from reality and escape into the persona of a pop culture-obsessed geek with a penchant for rambling on about Star Wars and Batman. However, I can’t begin this review of Disney’s The Muppets without first saying why it was exactly the movie-going experience I needed on Friday night, Nov. 25. For some reason, my family’s pets always seem to shuffle off this mortal coil on or around Thanksgiving Day. This year, it was Shadoe, a dog that I was fortunate enough to have in my life for more than 15 years—nearly two years beyond her expected lifespan. As lucky as we all were that she hung around for so long, having to take her to the vet to be put to sleep wasn’t exactly what I wanted to do on the morning after Thanksgiving. Needless to say, I was bummed. Fortunately, a text from a friend lifted my spirits almost immediately: that night, we’d be seeing The Muppets. If you know me—and if you’re reading this, chances are you do—then you know I’m pretty much a Muppets fanatic. I proudly and frequently wear my Animal T-shirt, I have multiple versions of “Rainbow Connection” on my iPod and I quote Statler and Waldorf whether the situation calls for it or not. 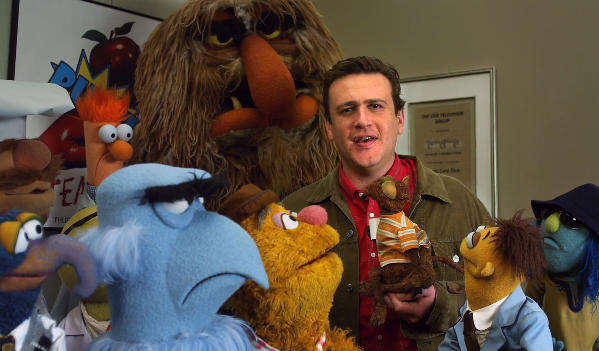 Naturally, I was excited when I learned that Jason Segel was resurrecting The Muppets in a new feature film, and the string of trailer parodies and promotional footage released over the last several months did little to lessen my enthusiasm. Based on what I’d seen before stepping into the theater, Segel “got it.” The Muppets don’t need to be transplanted into other stories, as was the case with The Muppet Christmas Carol, Muppet Treasure Island and The Muppets’ Wizard of Oz. Kermit, Fozzie, Miss Piggy and the gang are interesting characters in their own right. Thanks to Segel’s unbridled passion for The Muppets, he’s made them wholly relevant for the first time in two decades. The film introduces us to blissful not-yet-married couple Gary (Segel) and Mary (Amy Adams), who venture to California to celebrate their 10-year anniversary. Accompanying them in this trip is Walter, Gary’s felt-skinned Muppets fanboy brother who dreams of one day meeting his heroes. Gary and Mary take Walter to the Muppet Studios in Hollywood, but the property has fallen into disrepair because the general public has stopped caring about The Muppets. Art imitating life? Absolutely. While visiting the run-down remains of Kermit’s office, Walter learns of a sinister plot by aptly-named oil magnate Tex Richman (played to a devious tee by Chris Cooper) to buy the Muppet Studios and the iconic Muppet Theater to gain access to the black gold surging underneath it. Once Walter, Gary and Mary alert Kermit to Richman’s plan, it gives our favorite amphibian a good reason to get the gang back together for one more show to raiseenough money to save the theater and the studios. It’s not the most original storyline in the world, but The Muppets throws so many gags your way that it’s easy to move past the banality of the premise. From Kermit’s 1980s’-era robot butler serving up Tab and New Coke to Miss Piggy’s new occupation as the plus-sized editor of Vogue Paris to the introduction of a group of hard-edged Muppets knock-offs called “The Moopets,” Segel, co-writer Nicholas Stoller and director James Bobin (Flight of the Conchords) are relentless in their quest to satiate longtime fans of the characters while reintroducing them to the public at large. It’s cool seeing The Muppets reunited on the big screen, but the entire film would fall apart if we didn’t care about the human characters, so it’s a good thing that Segel and Adams approach their performances with the proper amount of self-aware hamminess. Their enthusiasm shines particularly bright in the film’s many musical numbers, four of which were written by Flight of the Conchords star Bret McKenzie. One ballad in particular, “Man or Muppet,” had me in stitches, and telling you why would ruin the surprise. If you were afraid The Muppets would somehow tarnish your childhood memories of these characters, rest assured that this film is essentially one long love letter to Muppets mastermind Jim Henson and anyone that holds a special place in their heart for the world he created. Go see it.